Just a reminder that next week Wednesday is the LAST day to RSVP for the Juuguya Moon Festival on /Sunday September 7th starting at 5pm. at Jikoen Hall. Please send in your RSVP by email at ukwanshinevents@gmail.com or call 808-845-5192. We will open at 5pm. for registration and will begin dinner at around 6 pm followed by music and entertainment. For those of you who will be coming from the Tamagusuku Ryu Senju Kai’s Show at Mamiya Theater, Thank you very much for making the time and joining us for this traditional Okinawan event! It will be a great continuation from that show to have dinner and relax with more entertainment making it a full day of Okinawan culture! 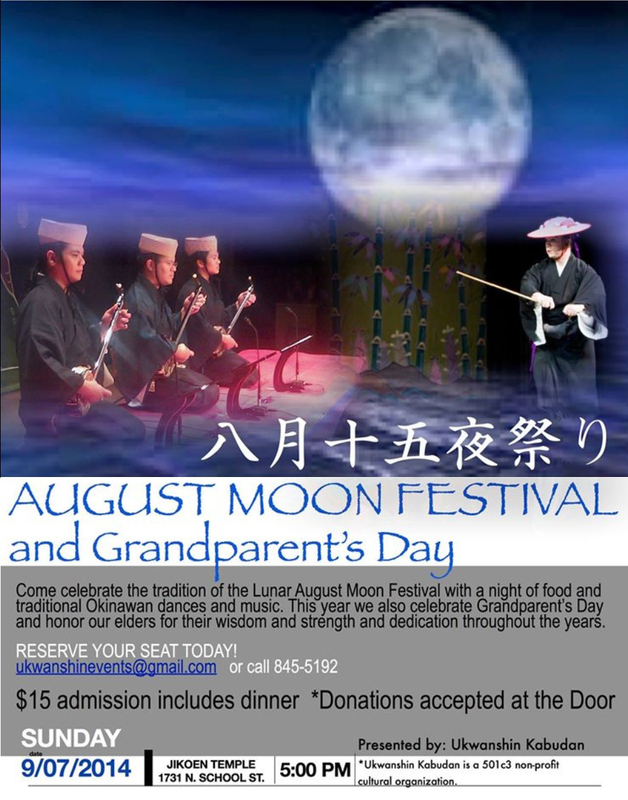 The Juuguya Moon Festival is $15 donation which includes dinner. We will also have Mochi Moon Cakes specially hand made for sale. 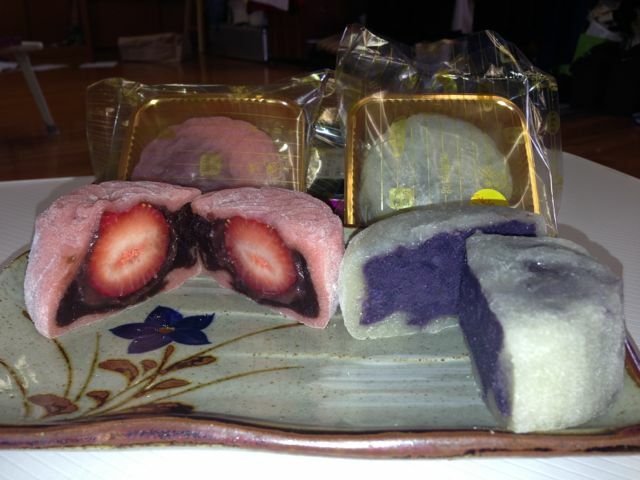 Flavors are fresh strawberry filled, Okinawan Sweet Potato, and Honeydew, for $4.50 each. Please put in your order early. We will have some for sale at the event, however, last year we did sell out before dinner even started. *Juuguya is a traditional celebration event in Okinawa that celebrates the lunar August moon and also gives thanks for a good harvest. Its a good time to reflect and get together to share stories, food , culture and just have fun and relax as we connect with our ancestors in something that is part of our Okinawan culture. We have this event annually according to the lunar calendar, as we try to follow the traditional lunar observances as much as possible to pass down the traditions and cultural responsibilities passed down by our ancestors. Have a great Labor Day weekend and a safe and fun time at this weekend’s festival! 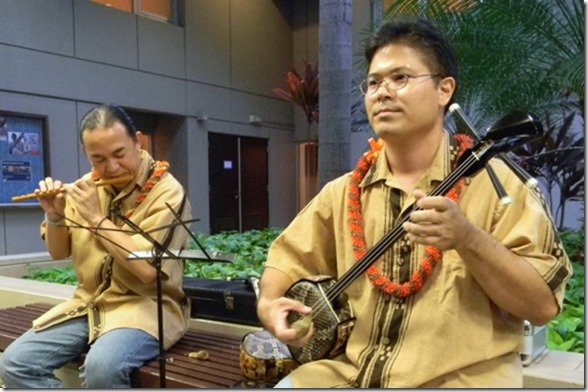 Eric Wada, flute, and Norman Kaneshiro, sanshin. Hanjo Bushi by Sensei Eric Wada. Uploaded to YouTube by Champuru on 6/18/12. Okinawan strawberry filled mochi and Okinawan sweet potato mochi moon cakes. This entry was posted in Announcement, Art, Culture, Dance, International, Music, Travel. Bookmark the permalink.